Sam HORSFIELD (21) won the 2017 Final Stage of the European Tour Qualifying School at Lumine Golf & Beach Club in Tarragona, Spain. The Florida-based Englishman was simply too good for Lumine’s Hills and Lakes courses and for that matter the rest of the field. Following in the footsteps of Nathan KIMSEY last year he becomes the second player in a row and the third in total to come through all three stages of Q-School and win. Horsfield left the University of Florida in May 2017 after his sophomore year had concluded. He had enjoyed a superb freshman year in US College golf in 2015/16 but had been inconsistent in this his second year, distracted by trialling equipment ahead of his move into the paid ranks. A former amateur world number 1 and arguably Britain’s strongest golfing prospect in the last few years this victory should come as no surprise to anyone. After a few starts on the PGA Tour Sam chose to try his hand in Europe this summer and received invitations to three late season tournaments. He made the cut at both the Made in Denmark (T49 -3) and Portugal Masters (T59 -4) but missed out at the KLM Open (T99 +3). In summary a steady if unspectacular start to his pro career. His 2017 European Tour year to date earnings of €12,800 have now been more than doubled by the Final Q-School winner’s cheque of €16,000. Connor SYME (22) finished tied 9th on -17, continuing his seamless transition over the last 2 months from amateur golf and the 2017 Walker Cup match to the professional game. Jonathan THOMSON (21) finished tied 18th on -14 capping a great season for the Yorkshireman. He finished 9th on the PGA EuroPro Tour Order of Merit and also showed he belonged on the European Tour with strong performances at both the D+D REAL Czech Masters (T54) and Portugal Masters (T25). It was also good to see Gavin MOYNIHAN (23) progress. The Irishman, who played in both the 2013 and 2015 Walker Cups finished tied 25th on -13. After finishing 19th on the Challenge Tour’s 2017 Order of Merit he has clearly taken another important step forward this week. English pair James HEATH and Ben EVANS should also be congratulated too, having fought their way into the Top 25 and ties on the final day. They both shot 66 (-5) when it mattered most in Round 6. Horsfield, and the other players who finished in the top 25 and tied for 25th place, can now look forward to 2018 with confidence and the foundation of Category 17 and 5 cards for the European Tour and Challenge Tour respectively. 156 golfers started out in the Final Stage marathon with 49 from Great Britain and Ireland (GB&I) – 31.4% of the field. After a 72 holes cut, following two rounds on each of Lumine’s courses, 74 players remained representing those that had finished 70th and tied. 27 GB&I players made the cut with 12 going on to achieve 2018 European Tour Category 17 playing privileges. In total 33 players finished in the Top 25 and tied places. At the conclusion of play the leading 25 players (and ties) were eligible for Category 17 membership of the European Tour and Category 5 membership of the Challenge Tour for the 2018 season. With regard to Category 17 the European Tour will be adopting a new structure in 2018. The Top 10 Q-School finishers will be ranked first, followed by those players who finished 101st-110th in the 2017 Race To Dubai and finally the 11th-25th Q-School leading finishers. The leading 70 players (and ties) who made the 72-hole cut will be handed Category 22 membership of the European Tour and Category 9 membership of the Challenge Tour. Those who missed the cut will receive Category 15 membership of the Challenge Tour. The 2017 Final Q-School has a total prize fund of €150,000. The winner receives €16,000 with those finishing in the Top 25 (and ties) reducing amounts down to €1,860. The competition was played over 108 holes on Lumine’s Lakes (6,909 yards, par 71) and Hills (6,975 yards, par 72) Courses. Whilst Lumine’s Lakes Course has hosted one of the Second Stage events for some time this is the first time the Club has been used for Final Stage Qualifying. The PGA Catalunya Resort in Girona has hosted the Finals for the last 9 years. 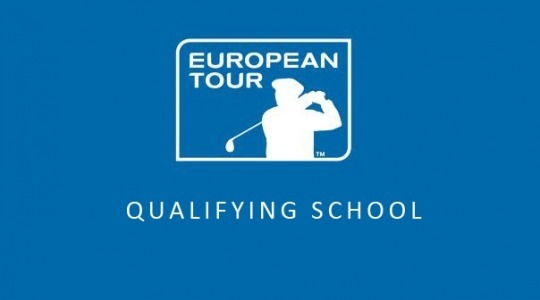 70 players were exempted into the Q-School process at the Final Stage. Amongst this number are many experienced pros and previous European Tour winners. If reaching this Stage isn’t hard enough make no mistake the bar is once again raised at the Finals. Eight First Stage and four Second Stage events were completed in recent months in the 2017 Q-School series. 176 players progressed from the former to Second Stage whilst 86 advanced from the latter to the Finals. Last year England’s Nathan KIMSEY (-13) won the Final Stage of the European Tour’s Qualifying School series at the PGA Catalunya Resort. Nathan was just the second player to come right through from First Stage to win Q-School outright. Sadly Nathan wasn’t able to retain his European Tour card during the 2017 season and as you can see above finished tied 50th this week. In fact just three players retained their playing status from the 30 2016 Q-School graduates. These were Eddie PEPPERELL (ENG), Edoardo MOLINARI (ITA) – who finished 44th and 66th on the Race To Dubai regular season standings – and Ashley CHESTERS (ENG), who was 110th but 8th on the Access List. The introduction of the Rolex Series and the ever rising standard of play means that making the most of a good finish at Q-School is unquestionably getting harder each year. Well done to the 33 2017 Q-School graduates. Enjoy your achievements this week and best wishes for next season.